1. Start by placing two pans on your stove, a saute pan for the mussels and a large pot for the pasta (this dish comes together very quick, so make sure all your ingredients are ready to go). Fill the big pot with water and bring to a boil, add about 1 T. salt and add the pasta. Do not over cook the pasta! 2. Right when you drop the pasta move on to the mussels, turn the heat to medium for your saute pan. Add the olive oil, garlic and chile, when these start to sizzle (do not burn) add the mussels and stir to coat. Place a lid on the mussels and let them cook while you wait for the pasta. 3. While you wait for the mussels and pasta, toss your bread crumb topping together (toasted bread crumbs, parsley and cheese) in a bowl and set aside to top the dish just before you serve. 4. When the pasta is done, drain and portion out between the two bowls. Next take the lid off the mussels (if mussel isn’t open, discard) and turn the heat off, add the juice and zest of the lemon-toss to combine. 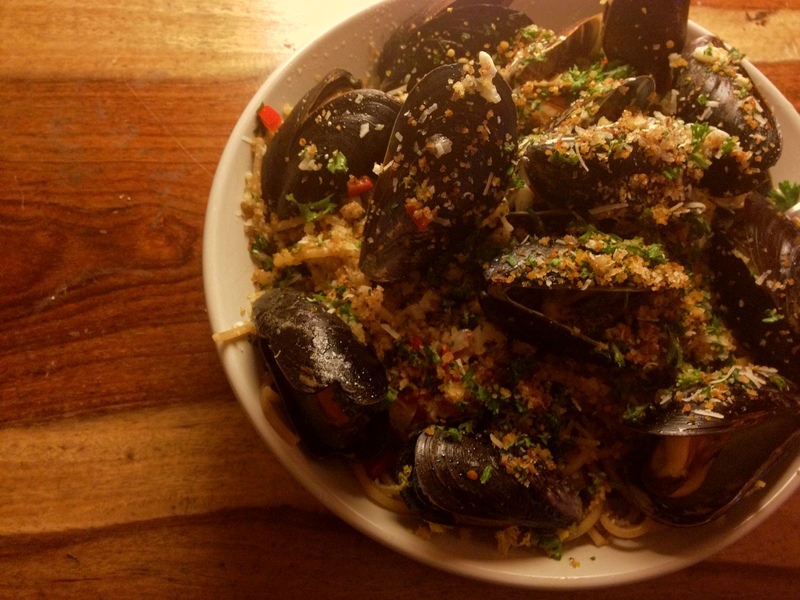 I split the mussels between the two bowls and then poured the wonderful sauce over the mussels and pasta. Top with the bread crumb mixture. Serve immediately! Mussels- Fish and shellfish are nutrient-dense and an excellent source o high quality protein, vitamins and minerals, but their content of omega-3 fatty acid is where we get the most bang for our bite. Mussels fall under a medium level group by their omega-3 fatty acid content. Look for blue or green mussels, farmed mussels are the ‘best choice’ because they are farmed in an environmentally responsible way. Whole Wheat Pasta- Whole grains in your diet may reduce your risk of certain chronic diseases. Certain cancers especially gastrointestinal cancer. Heart disease: antioxidant’s contained in whole grains may work with fiber and other compounds to reduce your overall risk. Lemons- This citrus fruit ranks high in its medicinal value and having many therapeutic uses. It is a good blood and body purifier and a mild diuretic. The juice also aids in the removal of old drug poisons from the body. Parsley- High concentration of antioxidants, a blood builder and purifier. It makes a wonderful tea and helps to release retained water from the body. I often order this dish when we go out for a special dinner, I have always been a huge fan of mussels and clams and especially over pasta. I’m Italian, what can I say?! Yesterday was the mine and Bill-y’s first date eight years ago, we usually do something special that day instead of Valentines Day (it just means more to us), and since we decided to spent the whole day out and have dinner at home I wanted to make something out of the ordinary. Bill-y probably would order this dish out (he usually orders a hamburger) but all I heard from him was mmm, mmm! He loved it, I loved it, all was well in the Cordary house last night. Happy Dating Anniversary my sweet… until next year. Enjoy!